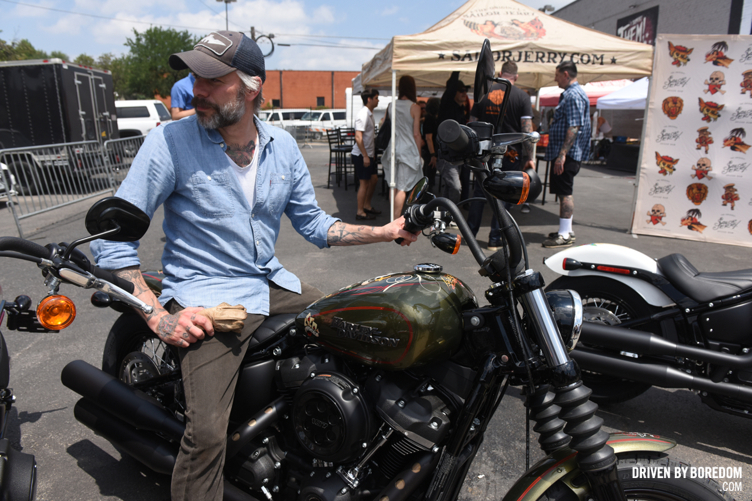 It’s time to get to the tattoo part of the 2018 Elm St. Music & Tattoo Fest in Dallas, TX. 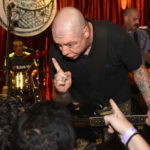 I covered all the music stuff yesterday, but I took way more photos of the tattooing since that was an all day thing and the bands were only at night. There were at ton of amazing tattoo artists who tattooed pretty much non stop all day for three days, and I say pretty much because I tried to get tattooed on Sunday and everyone I asked had this pause before they answered and I decided maybe it wasn’t the best idea to get tattooed by someone who has done nothing but tattoo and party for three days straight. 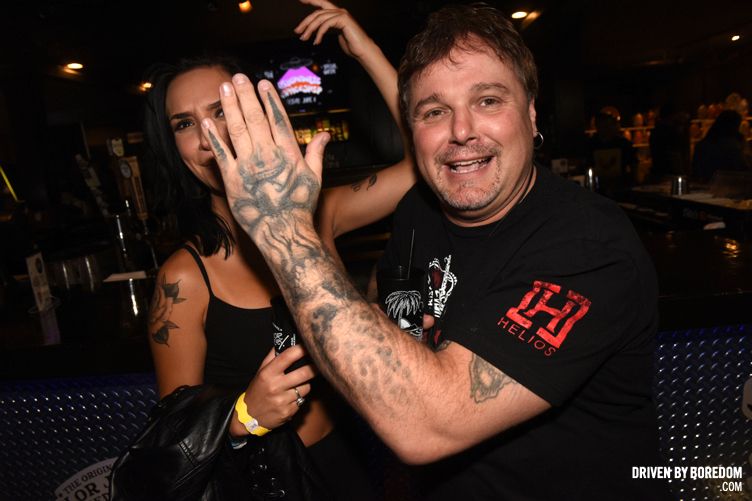 The tattooing all took place at the club Trees. 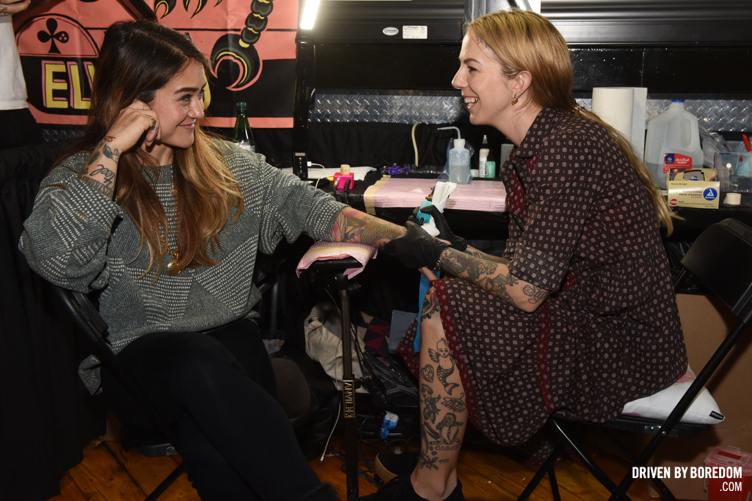 When I shot the Fest in 2013 they had the bands playing there, but this year they had two levels of tattooing. 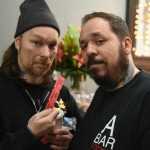 Of all the people tattooing the only one I’ve ever been tattooed by was Keith Underwood, but my buddy Phil LaRocca works at Elm St. and popped in a bunch throughout the weekend. 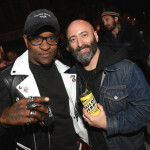 I’ve also been tattooed by Oliver Peck a handful of times, but he was too busy throwing the festival to do any actual tattooing. 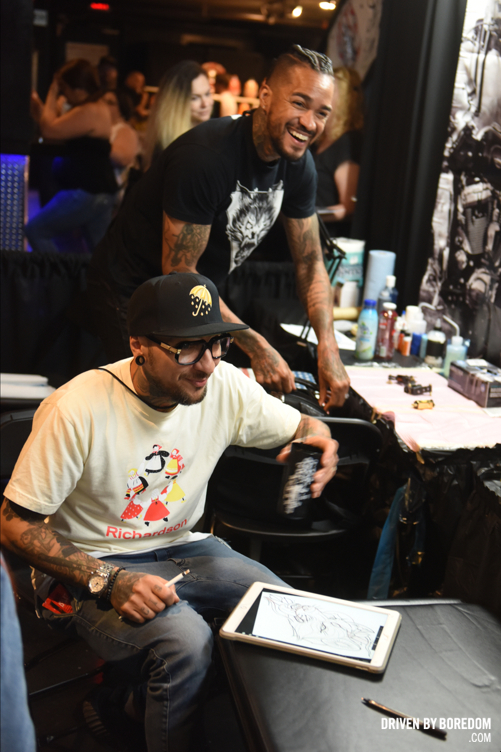 Speaking of Oliver, there were a bunch of Ink Master winners at the fest: Steve Tefft, Anthony Michaels, Ryan Ashley Malarkey and DJ Tambe tattooed downstairs with Dave Kruseman upstairs. Not really sure why Kruseman was upstairs but he’s probably the Ink Master I would most want a tattoo from. 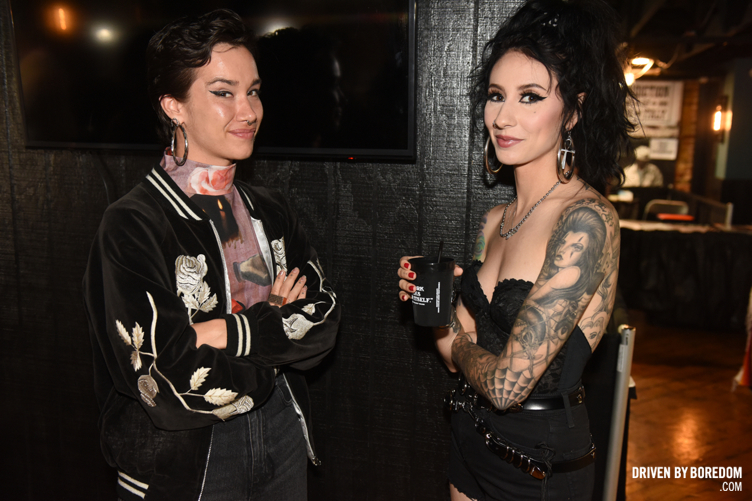 I actually love the show, mostly because I love listening to Oliver yell at people, but most of the people who go on Ink Master seem to be these art school tattooers that might look great on Instagram but maybe don’t have the training to make a tattoo last for decades. That being said, anyone who wins the thing is a pretty damn good tattooer, I just personally like tattoos that look like tattoos. And while I liked Anthony Michaels on the show, he was never someone who’s tattoos spoke to me, but he did one of my favorite tattoos of the convention. 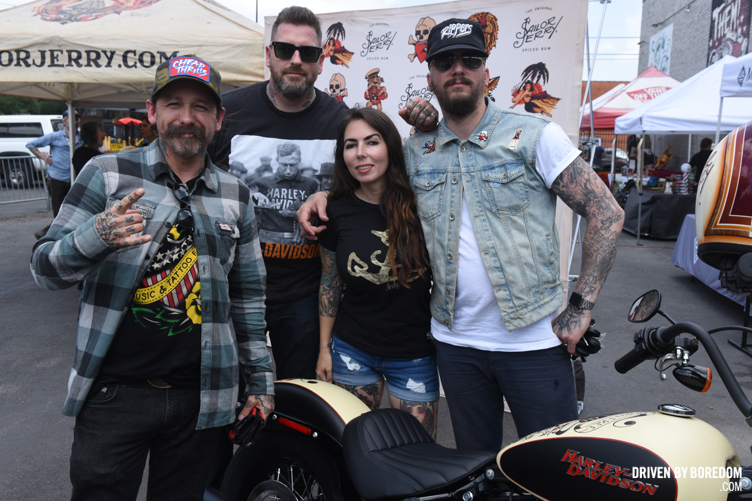 One of the big moments of the tattoo convention was the unveiling of the Sailor Jerry & Harley Davidson collaboration. They have six bikes designed by six different artists that you can win (enter here!) that were shown off for the first time on Saturday. 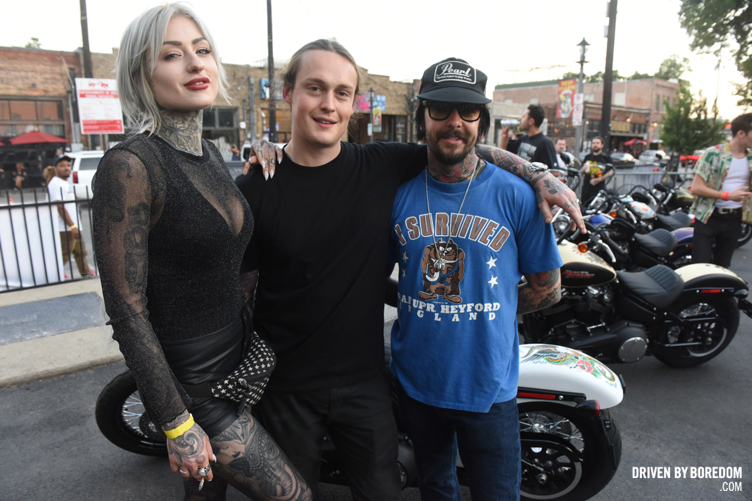 They were driven into the parking lot of trees by Oliver, Lucero’s Ben Nichols, Luke Wessmen who designed one of the bikes, Sailor Jerry brand ambassador Anthony Bohlinger, motorcycle journalist Raine Devries and “fastest woman in the world” Leslie Porterfield. The bikes are pretty amazing and I took a million photos of them so you can click through the gallery and check out all the bikes. Lastly, I uploaded a special gallery of the Sunday night dice game that was played at Heart in Hand art gallery. I was the only person allowed to watch that wasn’t in the actual game. I shot a similar game of cee-lo back in 2013 that raised money for True South, but let’s just say this game had a slightly less noble cause. In cee-lo the second highest roll is three sixes and one of the players rolled sixes pretty early on. No one was able to match him and it looked like he was going to win. Oliver was the second to last player to roll and made a big production out of his roll. Everyone was laughing about the whole thing until he rolled 4-5-6 the highest roll in the game. Everyone lost their minds and one roll later Oliver won the game. Okay, I think that’s about it, go check out the below gallery of over 200 photos, plus the bonus dice game gallery and I will be back soon with some new photos! 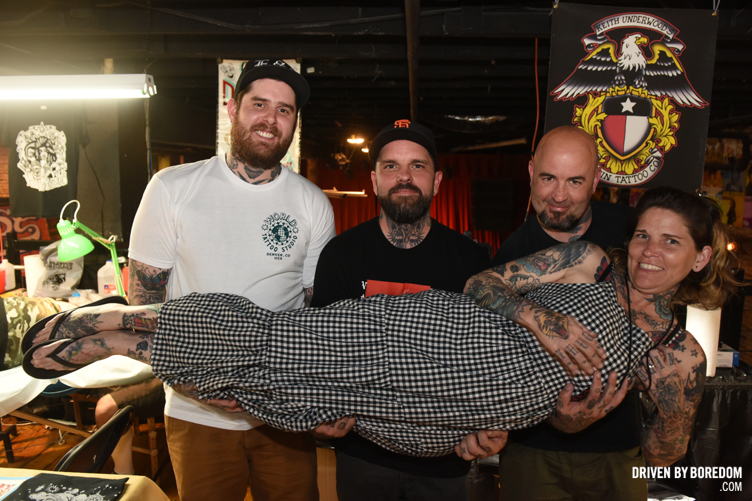 Click here to see all the tattoo photos from the 2018 Elm Street Music & Tattoo Fest in Dallas, TX.